The 2” Aero SWA eyepieces feature a 6-element construction in four groups. Exotic ED glass is employed in the design to significantly reduce false colour. 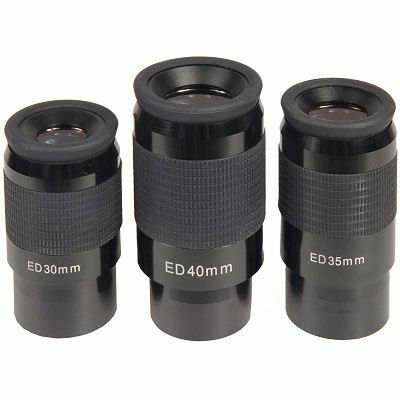 These eyepieces all feature impressively wide 68° fields of view, with virtually distortion-free images. Multi-coating is applied to all air-to-glass surfaces to increase light transmission and image contrast. All models feature edge-blackened lens edges and are parfocal. The eyepiece barrels are threaded to accept standard 2” filters. Twist-up rubber eyecups and generous eye relief for spectacle wearers. Finished in high-gloss anodized aluminium with knurled rubber grips. Available in focal lengths of 30mm, 35mm & 40mm, with eye relief of 16.7mm, 17.5mm & 20mm respectively.